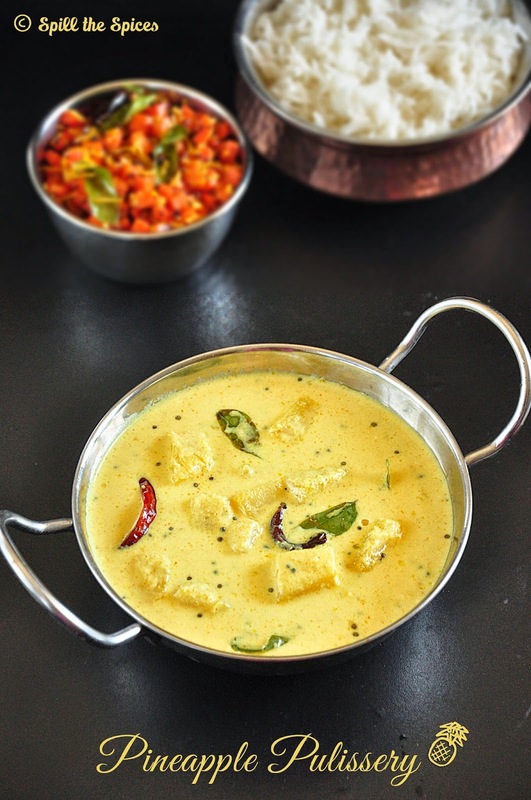 Pulissery is a traditional Kerala sweet and sour dish made with fruits or vegetables like mango, pineapple or ripe plantains (nendra pazham) and ashgourd, cooked in a yogurt and coconut gravy. There is another variation to this which is made without any vegetables or fruits. Pulissery is one of the dishes served as a part of the sadya menu. Today I'm sharing the recipe of pulissery with pineapple. 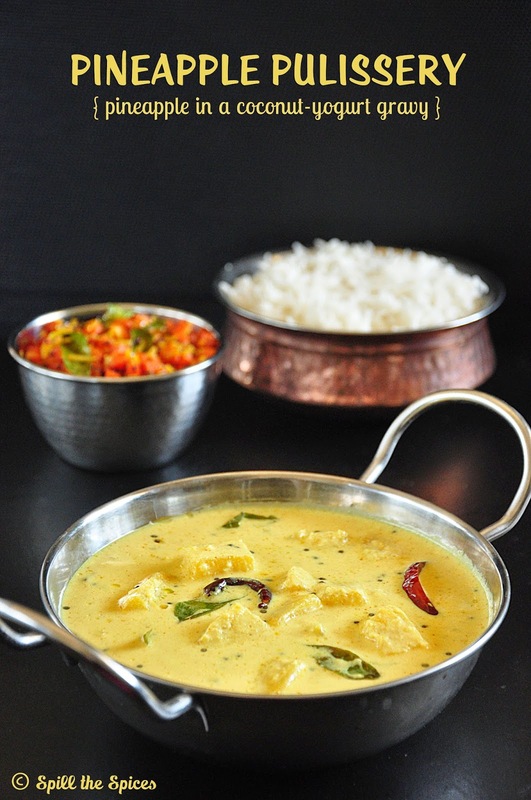 The sweetness from the pineapple, heat from the green chillies and sourness from the yogurt gives this curry a unique flavor. It doesn't take much time to put together this dish and can be served with rice and any thoran/mezhukkupuratti (stir-fry) of your choice. This is another simple dish that you can try for the ona sadya. Wishing all my friends and readers a very Happy and Prosperous Onam! Enjoy a wonderful sadya! 1. Grind coconut, jeera, green chillies and curd to a smooth paste without adding water. Add more curd instead of water to grind. 2. In a vessel, add pineapple, turmeric powder, red chilly powder, salt and about ½ cup water. Cook the pineapple until they are soft. 3. Once the pineapple is cooked, add the ground coconut paste. Bring to boil and let it simmer for about 3-4 minutes. 4. Meanwhile whisk the curd until its smooth and add the curd. Mix well and cook for another 2-3 minutes or until it is just heated. Remove from heat. 5. In a small pan heat oil and add mustard seeds.. When in crackles, add red chillies and curry leaves. Pour over the curry. If your pineapple is sweet, you can skip the jaggery or adjust it according to the sweetness of your pineapple. Do not boil after adding the curd, it will curdle. I have used fresh pineapple here. You can also use canned ones, but drain them and wash well. 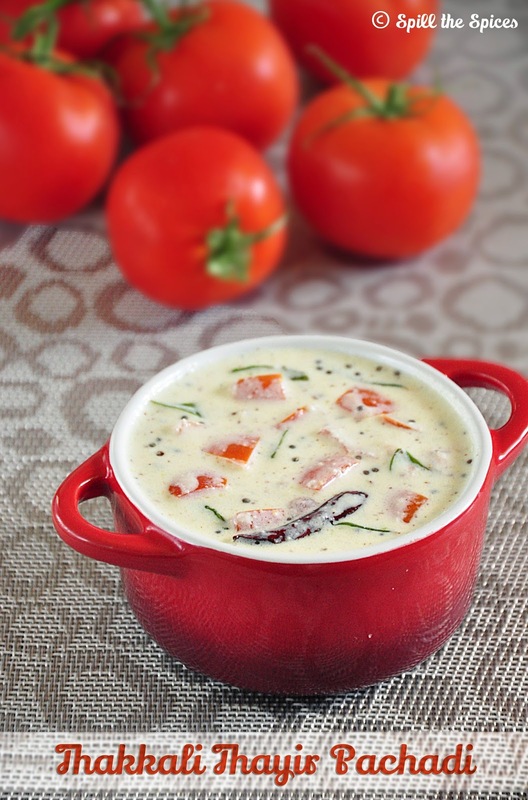 Pachadi is a yogurt and coconut based of Kerala cuisine with either a fruit or vegetable like tomato, pineapple, cucumber, ladies finger (bhindi), beetroot, pumpkin etc. It is an inevitable part of any sadya, even though it is served in a small portion. 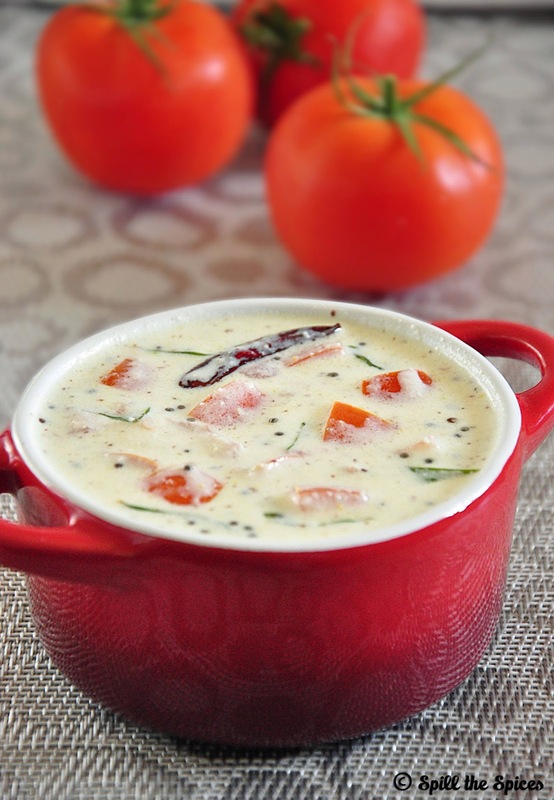 I have already posted vendakka (bhindi) pachadi, beetroot pachadi and cucumber pachadi , so today I'm sharing pachadi/kichadi with tomato. 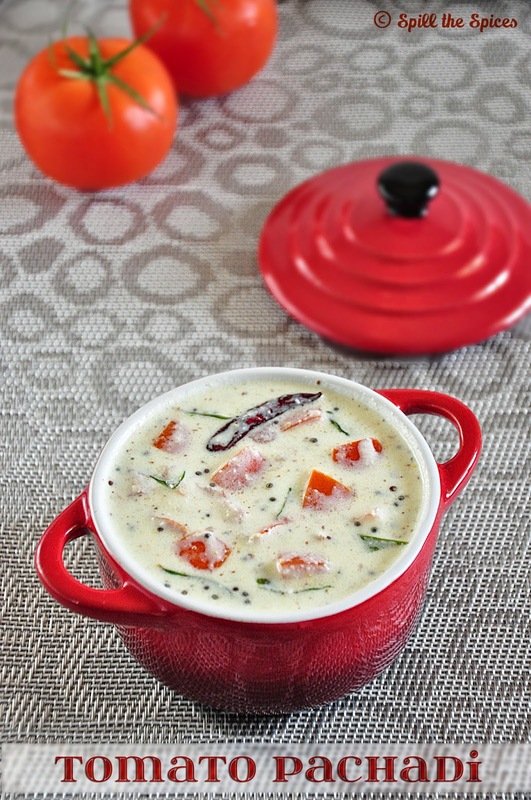 Tomato pachadi is a very simple and quick pachadi recipe that you can make for any sadya. 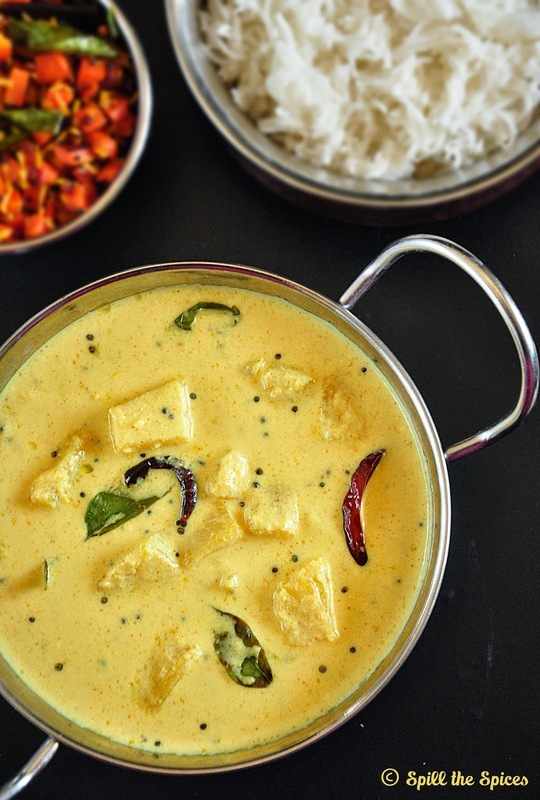 Not just for sadya, you can make this pachadi when you want to make a simple light lunch and serve with rice and any thoran/mezhukkupuratti (stir-fry) of your choice. It goes well with chapathi too. So try this easy pachadi for this year's Ona sadya. 1. Cut the tomato into small cubes. Add little salt and set aside. Whisk the curd until its smooth. 2. Grind together coconut, green chillies, mustard, curd to a slightly coarse paste adding little water if needed. 3. Add this ground coconut paste to the whisked curd and mix well. Add the tomato, salt and mix well. 4. Heat oil in a small pan and add mustard seeds. When it crackles, add red chillies, curry leaves and pour into the pachadi. You can use any cooking oil for tempering, but coconut oil gives the best taste.